Someone over at AutoWeek.nl just happened to be in the right place at the right time to catch photos of a mostly uncamo'd version of what good sense says is the 2009 FX. The next generation FX will likely be offered as the FX37, with with a 300+ horsepower version of the VQ. It's rumored that the FX50/FX55 will get a new V8 good for nearly 400 horsepower (and displacement of either 5.5 or 5.0 liters). According to information gathered last March, there are many new toys due for the next generation FX, including adaptive slow cruise control. 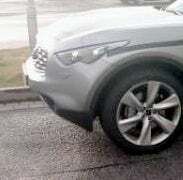 Focus Group Fever: What&apos;s Next for the Infiniti FX?